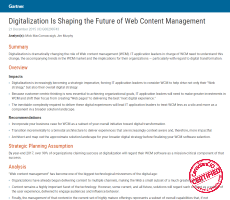 Digitalization is dramatically changing the role of web content management (WCM). Digital leaders are looking at WCM as a strategic imperative, to not only drive their website strategy, but their overall digital strategy. According to Gartner, by year-end 2017 over 90 per cent of organizations that claim success at digitalization will regard their WCM software as a mission-critical component of their success. IT application leaders require a new perspective on WCM and a new approach to selecting and optimizing WCM software. They need to understand the context of digital transformation to which the WCM software contributes. They need to begin with the target audiences to ensure that the experiences delivered are engaging and impactful.